In keeping with tradition, today we’re eating eggnog. For the last four years, my first post-Thanksgiving recipe has been an eggnog related breakfast dish. At first it was accidental but then I decided that I liked it. And it was tradition. And that I was doing it. Until I can no longer think of things in which I can shove eggnog inside. 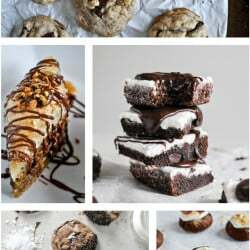 I’ve already made an eggnog breakfast crumble crunch cake and this eggnog chocolate chip bread. Which is totally a snack, because it’s bread. Definitely not a dessert. Just a snack. And now, oatmeal. In baked form because other than cookies, it’s really the only way I like to eat oatmeal. And it’s perfect, because this is one of the only ways I like to consume eggnog. We talk about it every year, but I’m one of those few-sips-and-I’m-done eggnog people. It’s not deliberate it’s just… enough. BUT. I haven’t had spiked eggnog before. That might be a game changer. Also: how? Who am I? I should probably make spiked eggnog now. Is it too late? We shall see. Since I can’t leave well enough alone, this baked oatmeal is topped with caramelized bananas and a fat drizzle of brown butter. Not just any brown butter, of course. Vanilla brown butter. I accidentally on purpose ordered about ten thousand vanilla beans off of amazon and am seeking as many uses as possible. I’ve already made vanilla sugar, a vanilla body scrub and have even put vanilla beans in some of my boring daily smoothies. Makes me feel fancy! And this pile of stuff on top of the oats isn’t too unusual- I rarely can eat baked oatmeal plain. Always need to trash it up with SOMETHING on top. Anything. ANYTHING! I’d also like to participate in a swim meet in that brown butter. Except I’d probably lose. Because I’d drown in my own brown butter consumption. This is what we’re eating today. We’re T-day detoxing with caramel fruit and butter for breakfast. That seems appropriate it, right? Would you expect anything less? It’s the holidays! Preheat the oven to 375 degrees F. Spray a baking dish with nonstick spray. I used a 10×7 dish, but an 8×8, 9×9, round cake pan or another size close to that will work too. In a large bowl, combine the oats, sugar, baking powder, salt and cinnamon. Stir well to combine. Add the egg, eggnog, coconut oil and vanilla extract, mixing well until combined. Pour the mixture in the baking dish and bake for 25 to 30 minutes, or until the oats are just set. To caramelize the bananas, heat a large skillet over medium-high heat and add the butter. Sprinkle the bananas with the cinnamon then add them to the skillet. Sprinkle the brown sugar on top of the bananas and cook them for only 1 to 2 minutes, until they are golden but not mushy, turning once or twice. If needed, do this in two (or even three) batches. To make the vanilla bean brown butter, add the butter to a saucepan and heat it over medium heat. Whisk constantly until the butter begins to bubble and brown bits form on the bottom. The minute you see the brown bits, remove the skillet from the heat and continue to stir for 15 seconds. Scrape the vanilla beans out of the pods and whisk them into the brown butter. 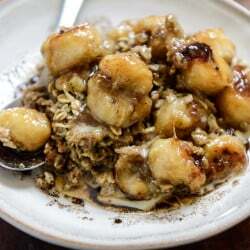 To serve the oatmeal, add the bananas on top and drizzle on a little extra eggnog. Drizzle the brown butter on top. Maybe we should just spike breakfast?